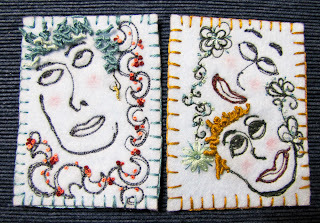 I certainly have gotten hooked on stitching artist trading cards. For anyone who is unfamiliar with atc's, they are miniature works of art 2 1/2 x 3 1/2" that are made in whatever medium one chooses and then exchanged. 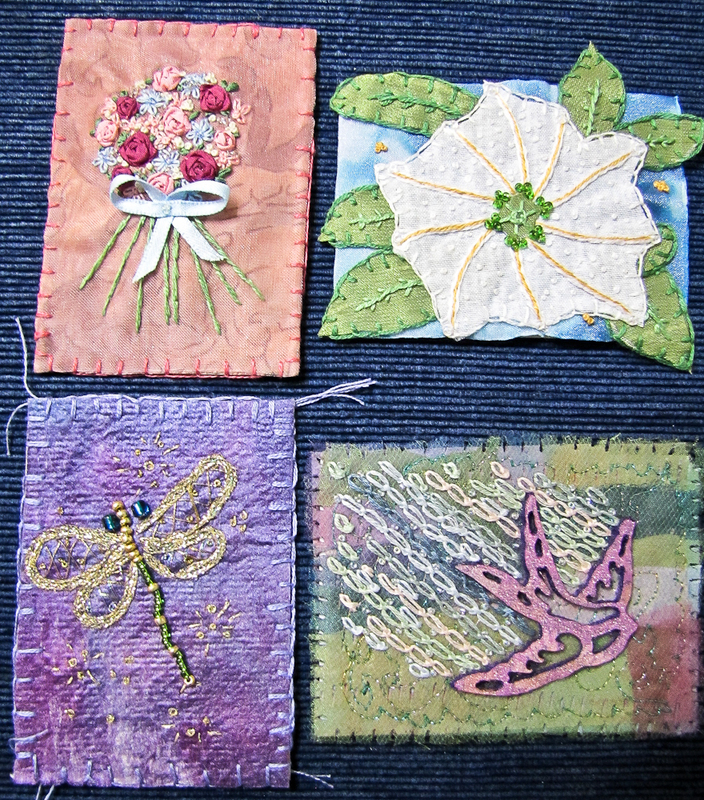 The first atc I made was the the white flower one on the right hand side inspired by Georgia O'Keefe's White Flower painting. 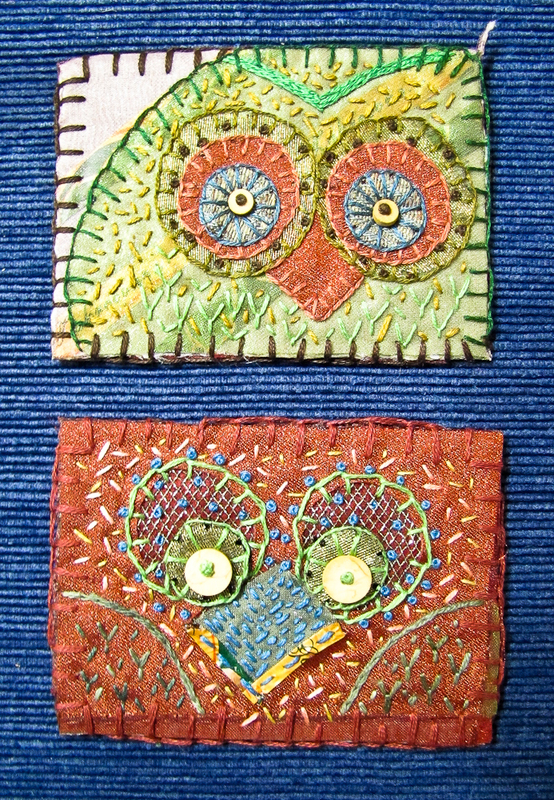 I know that atc's are meant to be traded but I was so pleased with my first atc attempt that I couldn't part with it. 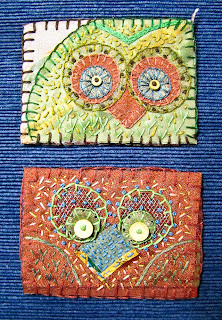 With the EAC atc swap coming up in March I decided to stitch a few owl themed ones and practice a bit of free motion machine sewing. I love the creativity and play one has in making atc's and the fact that they don't take long to finish. 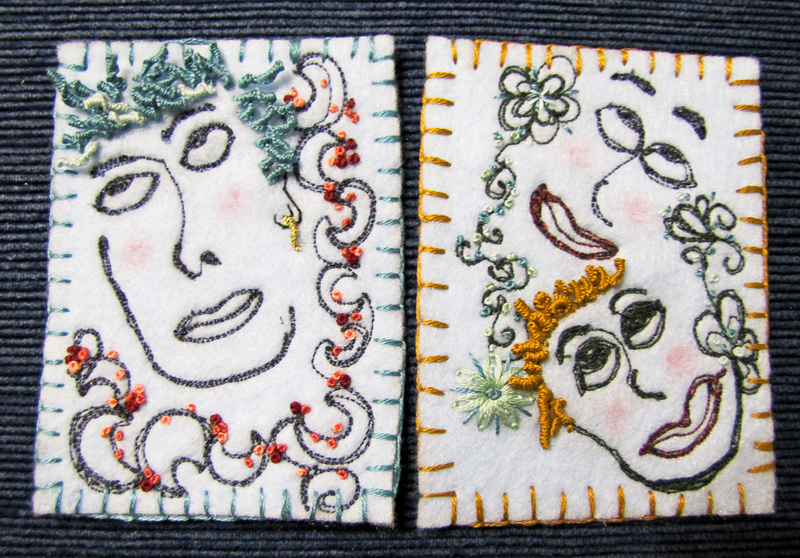 I had to try a couple of face atc's and had more fun with free motion machine sewing. 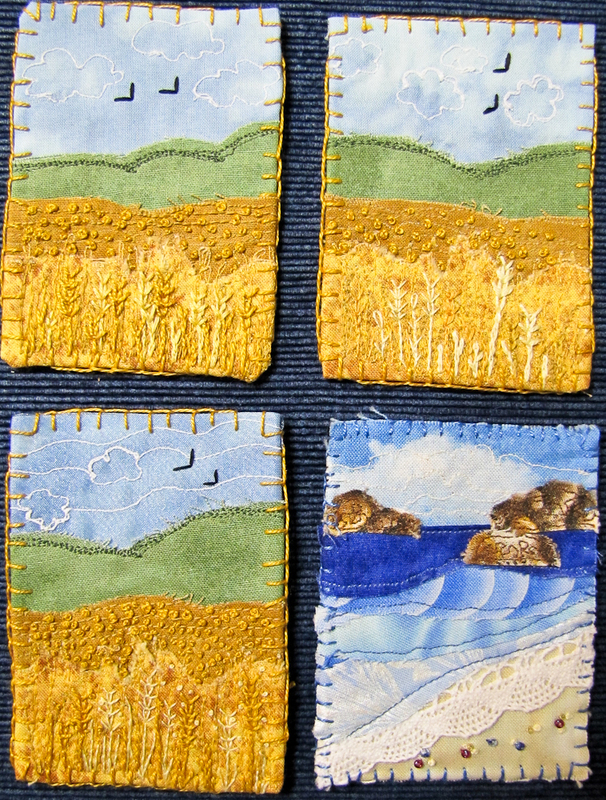 I also joined this year's Great Canadian ATC Exchange and made a few landscape atc's to swap. 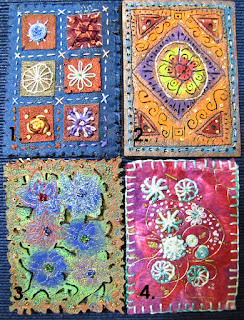 After taking Margaret Beal's excellent fusing class at the EAC Seminar 2010 in Regina, I learned to really enjoy playing with a soldering iron and fusing fabric. 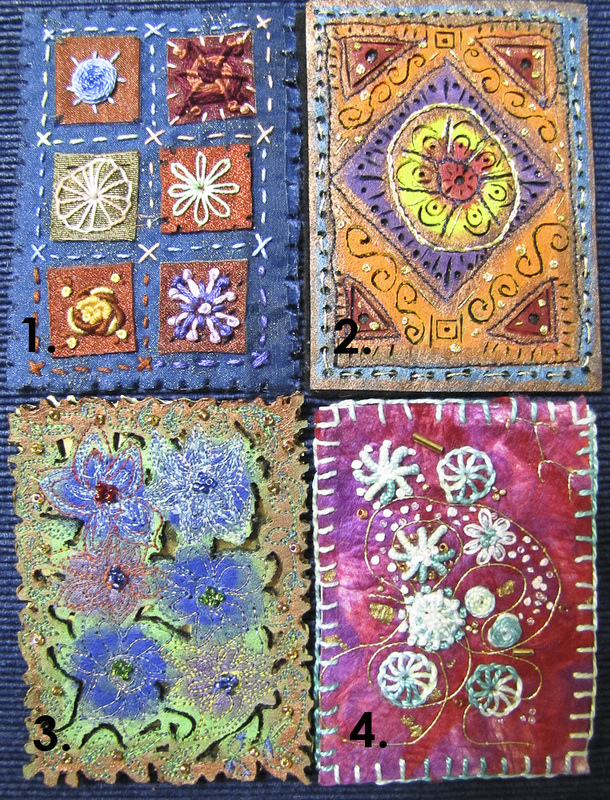 I did a bit of fusing and stitching on atc #'s: 1-3 and #4 was made after taking a silk paper making class. 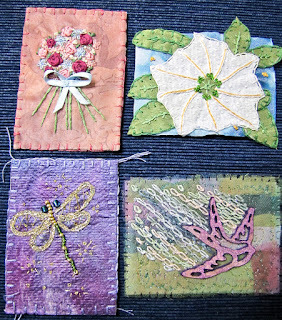 These are lovely... My Chapter was fortunate enough to host the ATC exchange for 2012.. what fun... such diversity and creativity.. these are going to be a 'hit' for sure with whoever receives them. 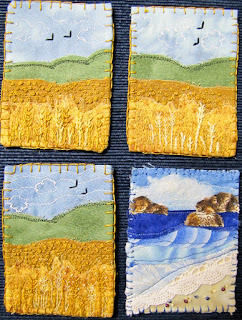 (lucky folks) the landscape ones are particularly interesting.. probably because there have been so few of these done in the past. 19 to trade? (one is your first so not counted).. imagine the fun you will have when the ones you get in exchange begin to arrive.. I guess it is time to get things together and think about (and stitch) some before this is gone from our schedule of events. Thanks for sharing. You have got the bug! 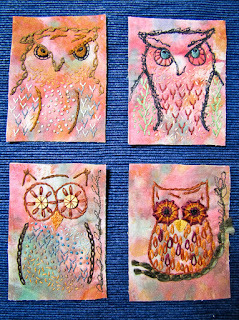 ATC's are really fun to make. 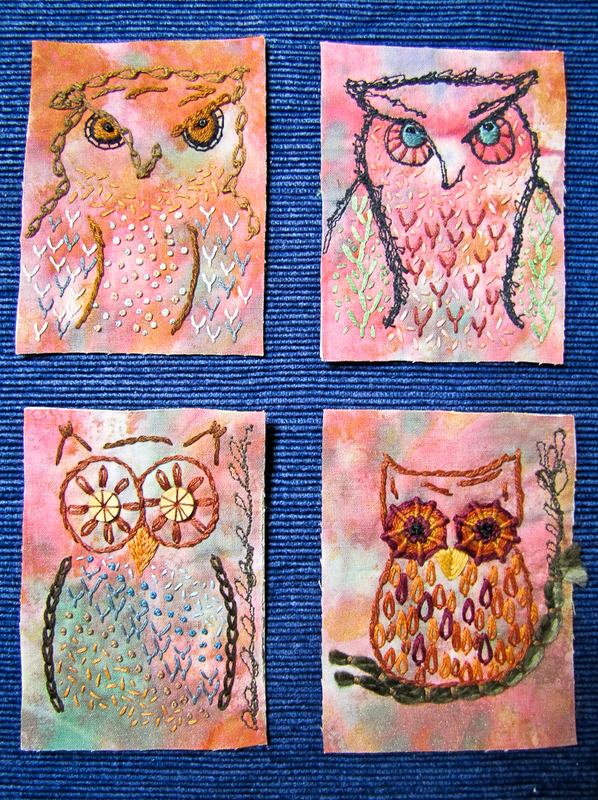 I love the owl cards and the fact that you used this medium to experiment and play. Your trading cards are beautiful. Looks like you have spent some happy hours creating these. What a wonderful and varied display - love them all!